Proceeding of the national seminar on processing and marketing of coconut held at Bangalore on 13th January 1994. Proceedings of the National Horticulture Conference 2000. The technologies evolved in the field of coconut research depicting the details on varieties, agronomy practices, integrated pest and disease management as well as processing aspects. The full text of the report of the study conducted by the bio-chemistry department, University of Kerala under the leadership of Dr.T. 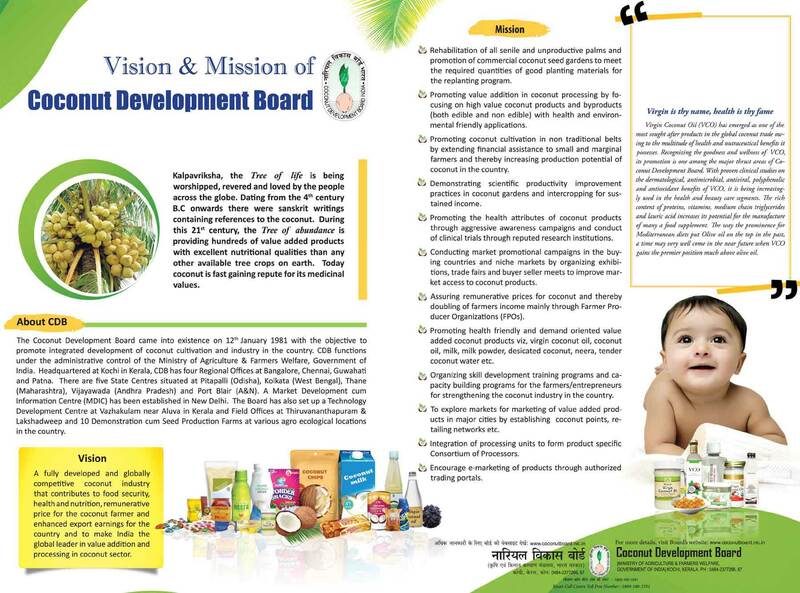 Rajamohan from 1992 to 1995 which was sponsored by the Coconut Development Board to re-examine the nutritional safety. Proceedings of the National Seminar on Coconut and Floriculture held at Thanjavur in 2002. The book highlights various options that are available in the field of coconut and floriculture. Covers all necessary aspects of coconut culture and industry relevant to the North Eastern States of India. Depicts the coconut nursery techniques right from the selection of seed gardens/ mother palms/ seed nuts, hybridization programme and seed garden establishment. Also gives the specific locations of the seed gardens where planting material are available.